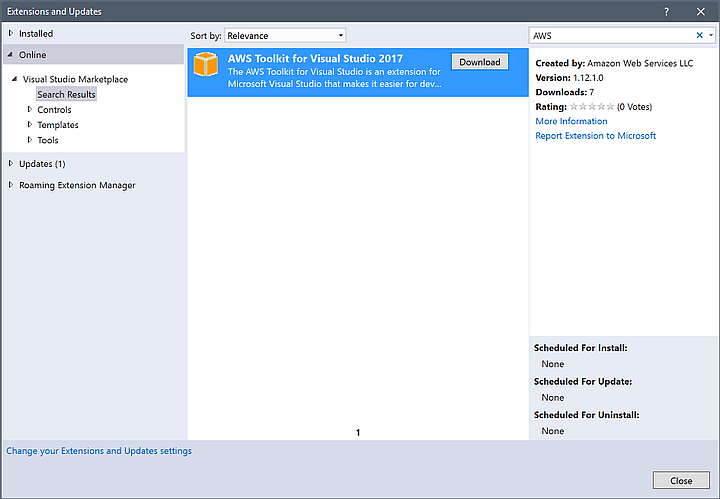 We’re pleased to announce that the AWS Toolkit for Visual Studio is now generally available (GA) for Visual Studio 2017. You can install it from the Visual Studio Gallery. The GA version is 1.12.1.0. Unlike with previous versions of the toolkit, we are using the Visual Studio Gallery to distribute new versions that target Visual Studio 2017 editions and those that follow. New features in the Visual Studio installation experience enable setup experiences that we previously required a Windows Installer to provide. No more! Now you’re able to use the familiar Extensions and Updates dialog box in the IDE to obtain updates. For users who require the toolkit in earlier versions of Visual Studio (2013 and 2015), or the awsdeploy.exe standalone deployment tool, we’ll continue to maintain our current Windows Installer. In addition to the toolkit and deployment tool, this installer contains the .NET 3.5 and .NET 4.5 AWS SDK for .NET assemblies. It also contains the AWS Tools for Windows PowerShell module. If you have PowerShell version 5, you can also install the AWSPowerShell module from the PowerShell Gallery. Thanks to everyone who tried out the preview versions of the AWS Toolkit for Visual Studio 2017 and for providing feedback!